ViewSonic offers 3D solution for its DLP projector range | What Hi-Fi? This little box of tricks from ViewSonic, the £299 VPD31 processor box, is designed to convert 3D video content so it can be displayed on the company's 3D-ready DLP projector range. 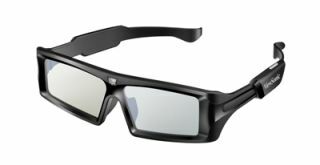 ViewSonic says the VPD31 will handle 3D TV, 3D Blu-ray and 3D gaming content when used in conjunction with the PDG-250 3D glasses. The box is compatible with ViewSonic's DLP Link 3D/120Hz projectors and has dual HDMI 1.4a inputs and a single HDMI 1.3 output. The second-generation PGD-250 3D glasses have been designed to be more stylish, lightweight and foldable, and will run for up to 44 hours after a full recharge via the mini-USB port on the side. "Unlike a television, the VPD31 and projector solution is scalable, allowing users to enlarge a 3D image to any size they choose without losing any quality at all," says Trevor Holt, ViewSonic's European project manager, projectors.